Located right on the Beach facilitating gorgeous unobstructed Ocean Views, The Sea Hawk a great place for your vacation. The deck is the perfect setting to discover dolphins swimming by or just peacefully watch the surf roll-in & out while the kids play on the beach below. Conveniently situated in close proximity to fine dining, shopping, museums & golf courses. 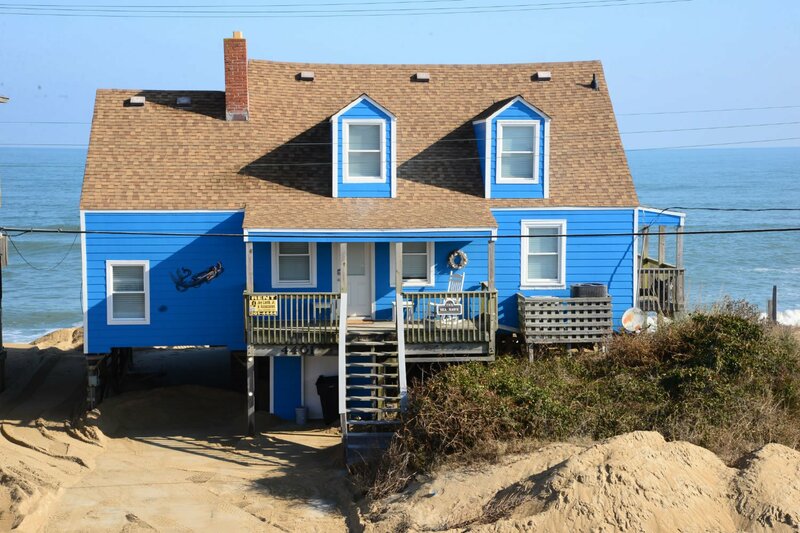 The Sea Hawk is a traditional Kitty Hawk Beach cottage & a good choice for families. Ground Level: Parking for 3 Cars & Steps to Mid Level Entry. Mid Level: Living/Dining/Kitchen Area, Exceptional Ocean & Beach Views, Large Flat Panel TV, 3 Bedrooms (Master Suite w/King, TV, & Full Bath, 1 w/Duo Bunk, & 1 w/Bunk Set), Half Bath, Sun Deck, 2 Covered Decks, & Enclosed Outside Shower. Top Level: 2 Bedrooms (Master Suite w/King, TV, & Full Bath w/Jet Tub & Master Suite w/Queen, TV, DVD, & Full Bath) & Ocean Views. Features include: C/AC & Heat, Washer/Dryer, Dishwasher, Microwave, Phone, 5 TVs, Premium Cable TV, DVD, Book Library, Wireless Internet, & Deck Furniture. No Pets. This is a Non-Smoking Unit. We have been staying at this house since long before it was the Sea Hawk. We love the location and have made so many memories there over the past 20 years. The outside shower is everyone's fav! Although this house is not new/fancy, everything that is important to me was excellent. Beds were comfortable, electronics worked without hassle, plenty of comfortable seating. I come to the beach for the view and it was just OUTSTANDING (and the outside shower was perfection. I really was able to re-charge during the week. We love staying at The Sea Hawk. It has such a homey feeling and is well equipped for the cook in our family! We hope to come back next year! We loved the house and decor. The home was very enjoyable and we loved being so close to the water. Love this house! The new bed was wonderful. The purple bean bag was a big hit with everyone .Very well equipped, just our favorite place to be. Porch is wonderful - location on the sand is perfect. Great for kids and a downstairs master bedroom is very convenient for those having difficulty climbing stairs. If you require upscale furnishings, this is not the place for you, however if you want comfortable this is a good place. We enjoyed the central location of the house, usually stay in Duck. All in all, a good experience. Home very clean and comfortable. Location is excellent. Very kid friendly. Beautifully decorated. Great location. Wonderful deck. Overall a great vacation home. The Sea Hawk is a lovely beach cottage we have rented many times over the past few years and we adore it. Who doesn't want to be able to walk a few steps off your back deck and the beach and ocean are right there? The deck is also partially shaded, which is a plus. We will keep coming back to the Sea Hawk every year we are able. We loved everything about the home. The kitchen was well equipped and the decor was charming. We are so happy that we booked it for next year!! This is a perfect home for one or two families who want to spend a lot of time on the beach. The full outdoor shower is a delight coming up from the sand!We coulnt have been happier spending a week with Grandparents, parents and 2 boys. Thank you for allowing us to share in the beauty that your home provides. It was very relaxing and much appreciated.